Revered for its buttery, vibrant colour, oil paints have had an enduring popularity with artists since the middle ages. Oil Paintings are known for their hardiness and durability and, if properly executed, your painting can certainly stand the test of time. 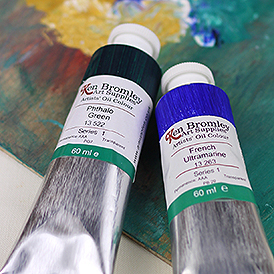 Use straight from the tube for thick impasto technique, thin for glazes or choose a consistency somewhere in between; either way you will be guaranteed brilliant colour! Oil Paints are manufactured by finely grinding artists' pigments and suspending them in drying oils. The earliest use of oil paint can be traced back as far as the 7th century to cave paintings found at Bamiyan, Afghanistan. It is thought that these primitive oil paints were created using oil extracted from walnuts or poppies and mixed with naturally sourced pigments and resins. Oil painting established its popularity further afield in Europe as early as the 11th century. For many years the preferred medium for artists was 'Tempera' - usually bound with egg yolk, but as creatives experimented with binders some chose to replace the yolk with various waxes and oils. Following these experiments the first oil paints were developed. Linseed oil became a popular choice as a binder as it was found to be very versatile; allowing smooth blending, easy layering and transparent glazing. Oil paints were soon found to be much more adaptable than Egg Tempera due to their longer working time and their ability to render fine detail. They also provided much more durability; the drying oils present in oil paint react with oxygen in the atmosphere causing the oil film to harden. This hardened film provides extra protection and ensures the pigments will stay vibrant for many years. A group of 15th Century Flemish artists are often creditted with refining and developing oil painting techniques and methods, and it is Jan van Eyck that is commonly thought to have expanded the influence of oils further throughout Europe. The favoured medium of masters like Velázquez, Rembrandt and Vermeer, this painting medium and method have seen enduring popularity with artists and still remains as popular as ever. The making of oil paint has remained very much the same since its early development. Some of our favourite earth colours, like ochres and iron oxides, remain relatively unchanged since they were first used. Following various scientific developments, many artists pigments can now be synthesised in a lab. Contemporary artists pigments will also undergo testing in a lab environment to ensure that they are chemically stable, lightfast and permanent. The two primary ingredients of oil paint are the pigment and the drying oil. Each pigment will have its own unique characteristics, including absorbancy, particle size and transparency. These varying attributes will affect the milling of the pigment and also the ratio of oil and pigment used in the recipe. The drying oil used will also vary from pigment to pigment. Most pigments will be ground with Linseed Oil, however some paler colours may use Safflower oil which is more resistant to yellowing. 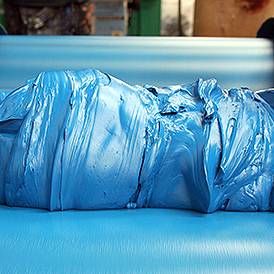 Some manufacturers may add other ingredients to their paints to enhance certain qualities. Alkyd resins are added to some ranges, like Griffin, to speed up the drying. 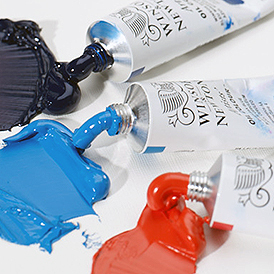 Waxes are added to Winsor & Newton oil bars to allow them to be shaped into a pastel form. Driers are sometimes used in student ranges to speed up the drying process. During paint manufacture, pigments are processed to a fine powder and then ground by strong friction in steel roller mills to disperse the pigment particles throughout the oil vehicle. Consistency is key to a successful oil paint; following the milling process it is important the paint is mixed to a smooth, buttery paste. Oil paints should never have a stringy or tacky quality. Typically a paint manufacturer will produce various batches of a particular colour with different ratios of pigment to oil. After testing the samples from each batch the manufacturer will be able to identify which mixture gives the best performance. Each paint sample will be put through various tests to ensure optimum performance. The particle size of the pigment is gauged to determine whether the pigment will need further milling. 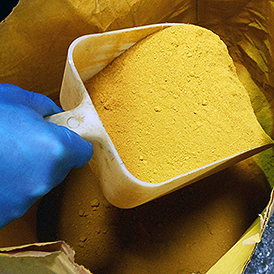 Pigments that have been insufficiently milled will not have as greater coverage as those that have been adequately milled. The drying time of each colour is also assessed. A colour lab will have records of the specific drying times of each of its colours; a sample from each batch will be tested and assessed to make sure it meets the correct drying time. Following the successful completion of laboratory tests the paint will be tubed and distributed, ready for you to pick off the shelves and create your next oil masterpiece! Oil paints are admired for their thick, vibrant colour. With a greater understaning of the working properties of oil paints you will be able to unlock the true potential of this time-honoured painting tradition. The oil painting process has been adpated and refined by artists over hundreds of years and, given proper care, it has been proven that oil paintings can stand the test of time. 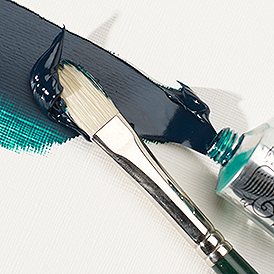 This exceptional durability attracts many artists to the medium, as well as the knowledge that these paints were the medium of choice for the masters. One appeal of oil colour is its long drying time; oil colours typically dry in between two to five days, although some colours can take up to twelve days to become touch dry. You may even find that with variations in temperature and humidity some colours may take up to weeks to dry. Although some prefer the quick-drying properties of Acrylics, the slow drying nature of oils certainly does have its benefits. As acrylic paint is squeezed onto the palette it has already started to dry, and although there are stay-wet palettes and mediums that can extend the working time of your paints, you will find it much harder to make complicated colour mixes. Oils are so slow drying that your mixes will remain workable on your palette for much longer. This slow drying allows for the creation of subtle variations in shade and hue that you would not have time for with acrylics. Their drying properties also allow time for reworking, correction and also the removal of paint. Oil paints are admired for their vibrancy. Artists' and Professional quality oils are very highly pigmented, which creates vivid colour that is relied upon by many artists. Oil colours also display no colour shift, so the colour you see in your tube will be the colour that dries on your canvas. Although they are not usable on as many surfaces as Acrylics, there are many mediums available that allow you to adjust the working properties of your oil colours to fit your creative vision. You may find it necessary to speed up the drying process, increase paint film flexibility or even prevent overthinning. Recent developments in oil paint manufacture have also seen the introduction of specialist oils that are fast drying and some that are even mixable with water. These new additions to the oil painting family give even greater choice to oils artists and also offer an exciting new way to get introduced to the medium. We stock a variety of different oil paints, with ranges suitable for all abilities whether you're an absolute beginner or a seasoned professional. Our oil range can be broadly split into two categories: artists (professional) quality paint and student quality. 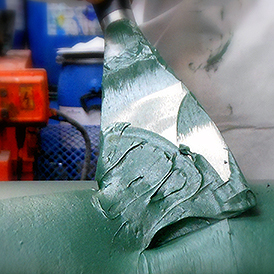 Professional or Artists' quality paint are made using the finest artists pigments. The pigments in these ranges tend to be much more finely milled, resulting in a smoother paint with a higher pigment density. These top of the range paints may come with a higher price tag, but they provide the smoothest, cleanest colour mixes for professionals. Artists' colours contain less additives and generally do not contain additional ingredients to homogenise the finish amongst all colours in the range; the natural qualities of each pigment are left untouched. Professional ranges also contain higher ratios of single pigment colours. Student quality oil paints are ideally suited to those working to a tight budget or those who use colour in large amounts. These types of paints still use quality pigments, but are sometimes less finely milled or include fillers to help the colour go further. Some manufacturers may also add additional ingredients to create uniform drying times or finishes across their range. Oil paints and oil mediums contain man-made and/or naturally occurring ingredients which could be toxic in high concentration. It is advisable to paint with any oil paints and solvents in a well ventilated area with a source of fresh air.